Clickbait is the lowest form of social media journalism, full of sensationalized headlines, grumpy cats, and awful personal confessions. Most pundits complaining about it say that it's a new invention for the short attention spans of the internet age. But that's not true. 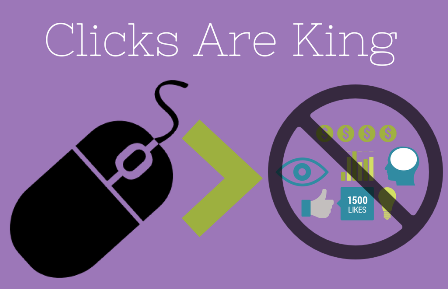 Clickbait's history goes back to the nineteenth century. In this political cartoon from 1888, called "The Evil Spirits of the Modern Day Press," we see many of the same "evils" that social media supposedly invented in the past decade. There is "paid puffery," which is equivalent to paid content. There are "bad pictures," which could be LOLcats; there are also "personal journalism," "scandal," "criminal news," "garbled news," and "boasting lies." Each of these, worded slightly differently, could be accusations about clickbait leveled at places like Huffington Post, Buzzfeed, Gawker and Upworthy. At the time, critics of these media evils called it "yellow journalism." The term came from a popular cartoon character called the Yellow Kid, who appeared in a comic strip in the New York World called Hogan's Alley. In the nineteenth century, newspapers were fighting for circulation numbers, the same way social media sites compete for unique visitors or eyeballs today. Essentially, these papers were using LOLcats to get their circulation numbers up. The Yellow Kid was like grumpy cat, except human. He was a kid who lived in the slums, who would appear with wacky sayings on his nightshirt, usually written in broken English. Instead of LOLspeak, you had slum talk — but the upshot was the same. People were buying these papers to read stupid cartoons, not to get the news. One critic called it "Yellow Kid journalism," but the phrase that stuck was simply "yellow journalism." Last year, XKCD's Randall Munroe made fun of clickbait headlines by writing up an imaginary timeline of major events in the twentieth century and giving them headlines like "Avoid Polio with This One Weird Trick" and "17 Things that Will Be Outlawed Now That Women Can Vote." The joke is supposed to be that nobody in the twentieth century would have written such ridiculous headlines. But the real joke is that, except for the contemporary idioms, Munroe's headlines would have been perfect for yellow journalists. Note that on the bottom there's a little box that says "Skirmish!" that details how much bigger this newspaper's circulation is than its rival papers, The World and The Herald. This is roughly equivalent to the way many social media outlets today proudly display the number of "likes" or "upvotes" or "uniques" next to each story. Yellow journalism came of age during the period when William Randolph Hearst's New York Journal was competing for circulation numbers with Joseph Pulitzer's New York World. Things got so heated in their war for eyeballs that both papers would take any opportunity to turn the boring daily news into sensational, Earth-shattering events. That's one way that the sinking of the U.S. vessel Maine in a Cuban harbor went from an accidental explosion to a possible attack by Spain. Here are famous covers from the Journal and the World, suggesting that the Spanish attacked the Maine in the harbor during talks between the two countries on neutral Cuban ground. People on the scene, who examined the ship after the explosion, said that it likely originated inside the vessel. It was probably an accident. But tensions between the U.S. and Spain were already running high, and it was easy for journalists to turn a hard-to-diagnose explosion into a possible act of war. The U.S. State Department maintains to this day that "yellow journalism" helped instigate the Spanish-American War, which was fought mostly in Cuba and the Philippines. It's interesting to consider that over a century ago, Hearst and Pulitzer's papers were considered largely yellow journalism enterprises. And yet now Pulitzer's name adorns the Pulitzer Prize, one of the most respected honors any journalist can receive. To get the full force of this irony, imagine that in fifty years, the most important award in journalism is called the Buzzfeed Prize or the Gawker Award. 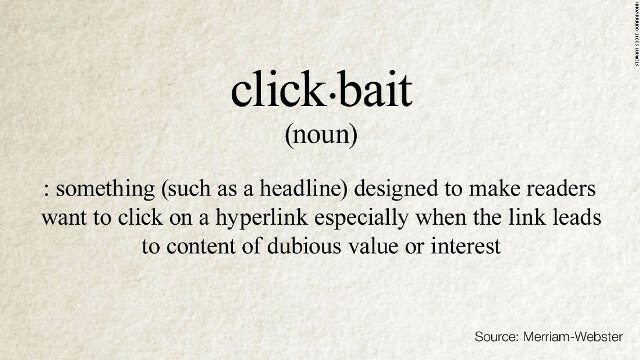 If you want to consider the historical facts, rather than read the yellow journalism stories that sensationalize clickbait, then you'll be forced to accept that clickbait is nothing new. Journalists and news sources — even respectable ones — have always used trumped up headlines and dumb pictures to lure people into looking at what they've written. Sometimes this practice is harmless, or even beneficial. Maybe people will come for the LOLcats but stay to read a piece of excellent investigative journalism or cultural analysis. In other cases, sensationalized news headlines and gossip can have extremely negative repercussions, fanning the flames of war or bullying innocent people. 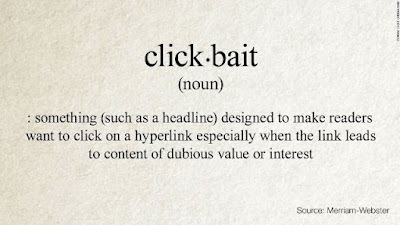 But to claim that clickbait is some nasty new disease cooked up by techies of the internet age is as shortsighted and ill-informed as clickbait itself.